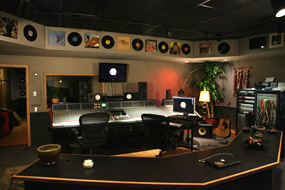 Wyman Records is a state-of-the-art, full service recording/mixing facility located in Burbank, CA. The studio was originally founded for music production during the 80's and was designed specifically for recording. The facility has undergone a complete aesthetic redesign, upgrades with both classic and cutting edge gear, updated and redesigned control room, and new wiring throughout the building. The studio not only offers state-of-the-art sound but also a great working environment and experience. 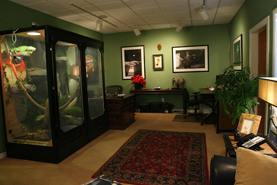 It's private, well located and 100% dedicated to the artist while they have it booked. Wyman Records was founded in 2005 by Tip Wyman, and has become one of the premier recording/mixing facilities in LA. Many artists, ranging from new independents to majors, have been drawn to the studio's character and privacy. The studio provides a vast selection of vintage to cutting edge gear, a lengthy microphone list, and a highly skilled technical staff who takes pride in our impeccable recording and mixing equipment. Please visit the site for all the details. Our Recording director is Jeff Kanan, Wyman's full time in-house producer/engineer. Our clients include: WMG, Sony/BMG, UMG, and Capitol," says Chief Engineer, Jeff Kanan who recorded and mixed the academy award winning song "Hard out here for a pimp" for Sony/BMG and Three 6. The studio is private with minimum distractions and offers the standard staple of gear. "Additionally, bands/artists and labels like it because we're able to keep their production costs down. Wyman Records is a very comfortable work environment for budget conscious," says Kanan. Jeff provides recording services to all of our clients with booked studio time. He is a world-class producer/mixer/engineer who has worked with artists ranging from Staind to Madonna and producers like Tim Palmer and Randy Jackson. Our attention is to detail and the ability to accommodate diverse sessions is a major contributor to Wyman's continued success. Whether it's a 12-piece scoring session or a rock recording date, or mixing, we deliver the same care and precision to insure a smooth session. Wyman Records provides the service, efficiency and quality conducive to the creation of hit records. We do so on time and for an extremely competitive rate. We look forward to working with you!